Waiting in the southernmost part of the Valley of Barovia is a mountain range. There is a serpentine dangerous path that meanders through the mountains, this is the Tsolenka Pass. The place is dangerous in and by itself because of the crude weather, it is so cold that exploration without proper clothes will be impossible. They know or suspect the location of the Amber Temple and are looking for it. They come in search of a magic relic and suspect that it is located in the Tsolenka guard tower. The first one happens so early in the campaign that the PCs will most probably forget it. Morgantha the hag discloses this info if confronted by adventurers in the Village of Barovia (page 48). Second option is Rudolf Van Richten who has already pinned down the location of the temple. He is a great traveling companion for this part of the adventure, if Rudolf is going and the party has already met Ezmeralda, she’s can also tag along. Third option is Kasimir Velikov, who tries to conscript the party to accompany him to the temple in search for a way to bring his sister Patrina back to life (page 121). He’s a good option for a guide too. The point of the Tsolenka Pass is to serve as an intro to the Amber Temple. A note about this part of the adventure. Unless one of the three relics is hidden in the pass or in the temple (which would award a level) then this part of the adventure is strictly optional, because the party is able to achieve level 10 without visiting it. That’s important to know in case you are in a situation where you want to speed up the end of the adventure for real life reasons. If the party is boiling to visit the castle and ignore the hooks for the Amber Temple, there is no problem (if they have the relics). That doesn’t mean you aren’t going to throw those hooks at their faces anyway. 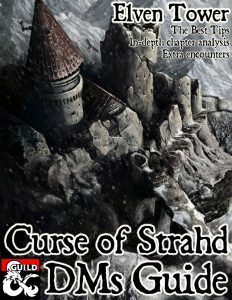 The best hook is the argument that Strahd’s power and secrets are hidden in the temple, PCs are going to go to get an edge on Strahd. The two possible guides/companions, Kasimir and Rudolf, have never visited the temple before so everything you tell the players is just hearsay and rumors. That should be enough to make them feel that there is a secret there that they need to find. If a relic is there then the rumor is solid. Otherwise, they’ll just go and find some magic items maybe, and most probably have a few dead companions because the pass and the temple are really harsh. By this point, the adventure is in killing-mode. The Dark Powers will not revive them anymore. Hopefully they’ll have a cleric with ways to raise the dead. Else, if The Abbot is still around maybe he can raise a fallen companion. Remember that the Tsolenka Pass is not just the guard tower and bridge; the Tsolenka Pass is a winding road that hugs the mountains and it starts in Area R in the Barovia map, just south to Lake Baratok. If PCs are not wearing appropriate clothes for cold weather, they suffer the effects of extreme cold. Since we all know no DM wants to do that, the easy way out is have one of the guides instruct the party to get the necessary items to avoid this. The first obstacle is a gatehouse in a wall that block further advance. This road was probably a way in and out of Barovia and thus served as a border wall. Now it just blocks access to the Amber Temple. The portcullis opens automatically as PCs approach, however there is a curtain of green fire behind it. PCs can either cross it or dispel it. If they choose to climb or go over the wall, two petrified Vrocks come to life and attack. Note: Depending on the party’s composition, level and number of players, two Vrocks is too low a challenge, you might want to add one or even two more for a decent fight. It’s important to soften the party before the roc encounter. Behind the gatehouse is a white tower with golden knight statues on top of it. There is little of value inside except maybe one of the relics, if that was the card reading location. This place also serves as a teleportation location from the hourglass room in Castle Ravenloft (Area K78, page 83). The tallest mountain in the range, Mount Ghakis, is home to a roc. This enormous creature has survived in the mountain range for thousands of years. This is the oldest living thing in the valley. The roc attacks as the party is crossing the bridge; you’re free to have this encounter happen as the party is on its way to the temple, or on the way back. The roc is a gargantuan monster that will probably stay flying during this encounter. Or it could land on the bridge too. This encounter is not meant to end with the roc killed. There’s low odds of that happening anyway. If the party proves too hard to chew, the roc simply goes away flying. If it can steal a horse or something like that the better. The party will probably look for safety inside the bridge’s guard posts. Things can go haywire here because of the grapple ability of the roc’s talons attack. In one of my games the roc attacked Kasimir and grappled him. Next turn a PC threw a Fireball and damaged the roc and almost killed Kasimir. Right after that the warlock used Hold Monster on the roc, who was at the time flying. It fell down to the bottom of the cliff near the Luna River. The fall didn’t kill the monster, who just stood up and flew away behind the mountains. It was moments later that Rudolf Van Richten said “Hey, where’s Kasimir?” So that’s that, he was never seen or heard of again. This is a fun encounter, and just like the roc’s encounter. It is not meant to last long, think of it as a way to scare a player or two. You can chant and dance in victory if Sangzor the giant goat runs down the mountain side, rams a PC and makes it fall 100 ft down the cliff, only to run and disappear in the mists. If you fail, it probably won’t work again since the party will swarm Sangzor. The book actually says it will flee if it takes 10 damage or more. More than just having the giant goat attack the party at the appropriate moment, the best thing you can do is have the beast stalk the party for a few hours before actually attacking. Way before they reach the gatehouse in the Tsolenka Pass, the party has a feeling of being watched. They also hear the bleating coming from the cliffsides, sometimes from above, or from below. When the time comes, your description of the goat attacking will bring closure to the foreshadowing. If things went well, the party has had their resources reduced by these few encounters and are ready to continue their way in search of the Amber Temple. Hi Derek, yours is a very useful CoS guide! Both the Vrocks and Roc felt too out of place in the campaign, so I replaced them with an Adult White Dragon (CR 13). – Argynvost was a Silver Dragon. the Monster Manual Says that silver and white dragons occasionally dwell in the same areas, often fighting each other. Thus, when Strahd killed Argynvost there might have been a hiding, lurking white one. A wyrmling maybe, which now is 400+ years older. – Tsolenka pass and Amber Temple are freezing environments: a white dragon fits just perfectly. – CoS is a great campaign, among the best ever released. An epic dragon fight over a stone icy bridge adds a lot to the experience. – A dragon is the perfect guardian for such an eerie temple: it might have learned that people come and go for that place, making the Tsolenka pass a good hunting spot, or it might have made some kind of agreement with Strahd himself (or just being subdued by the vampire, and forced to guard the temple in exchange for its life and the free food and treasure it might get from adventurers passing by). I hid a small treasure of coins and gems in an ice cave far below the cliff, roughly half the amount for such a CR. I scattered the rest, and a few magic items in the Amber Temple itself, making it even more worth exploring. The dragon fight has to be played smart and rough in order to be memorable: in melee, a 200 hp dragon would last for hust a couple of rounds against a level-10 party. Instead, it should prefer hit-and run-tactics, blasting its breath from above then retreating until it is recharged. It should dive and grab the weaker characters (e.g. those “not wearing steel”), in order to drop and crush them on the rocks, and should absolutely retreat for a short rest linking its wounds when it loses about 50-60% of its HPs. Of course, in my campaign this was not a random encounter: I gave lots of anticipation to the party, having Barovians and Vistani tell dread stories about the Tsolenka Pass and this “gargantuan snow-coloured ice-breathing roaring BAT”. Wow that’s an awesome idea. Did you leave out the roc encounter then? By the time my party was traveling to the Amber Temple, Strahd was to the point of regularly fighting, messing with, and tricking the players. On their way, I noticed there was some serious damage to the bridge on the map. I had a great encounter with the Roc coming in while the party was having a verbal sparring match with Strahd. Strahd kept taunting the mounted paladin (for some reason in my game mounts are very rare in Barovia) until he charged Strahd. Well the Strahd-illusion was standing over the damaged portion with an image-illusion showing an undamaged bridge! As the Roc is swooping towards the rest of the party, the paladin charges… and about 10 ft short of Strahd falls straight through the bridge. He dives off as his brand new war horse tumbles to its death after plunging through the illusion. 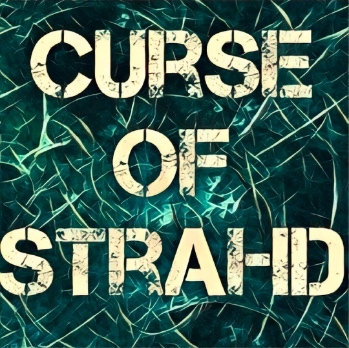 The Strahd-illusion laughs and disappears. The paladin would not have made it if he didn’t have boots of striding and springing and make the choice to push off his new horse – thus ensuring the horse’s demise. The paladin darn near cried, the fight with the Roc was quick, but very epic when combined with my evil horse murder. Thanks for inspiring me to come up with new and fun ways to have Strahd completely *bleep* with my party. Damn that was evil! I’m proud! Kinda sounds like Mario jumping and dropping yoshi.